Born and raised in Italy, Alan started his musical career on the electric guitar. From the age of 17, he performed in numerous gigs and concerts around the country. While occasionally filling in for drummers, he discovered his love for percussion, which became his main focus. He studied percussion in C.I.A.K. Institute of Music in Rome, and spent many years learning hand drums such as Congas, Cajon and Bata from masters of the art (Rosario Jermano, Luca Scorziello, Giovanni Imparato, Maurizio Ravalico, David Pattman, and El Panga). 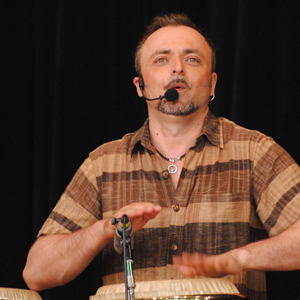 Alan has performed in various groups with repertoires ranging from Brazilian and Cuban Music to Italian Folk and Pop. He also has extensive experience as a music educator from teaching in schools across Italy and Ireland. Currently based in County Galway, he performs and records regularly in Ireland and abroad for various songwriters and orchestras (Emmet Scanlan and What The Good Thought, The Getaway Gondola, La Orquesta Kalamares and Baile An Salsa).